The experience gained in recent years by UNICEF in association with UNDP, World Bank water and Sanitation Program in partnership with hand pump[Afridev pump] field workers and developmental organizations has designed the afridev deep well hand pump has become an increasing choice in number of countries in Africa and Asia. Afridev deep well hand pump (vlom) is suitable for lifting water from depths of 10 mtrs. To 45 mtrs. Afridev hand pump is suitable for bore holes with casing sizes of 100 mm 115mm, 127mm, 150mm or 200mm internal diameter. 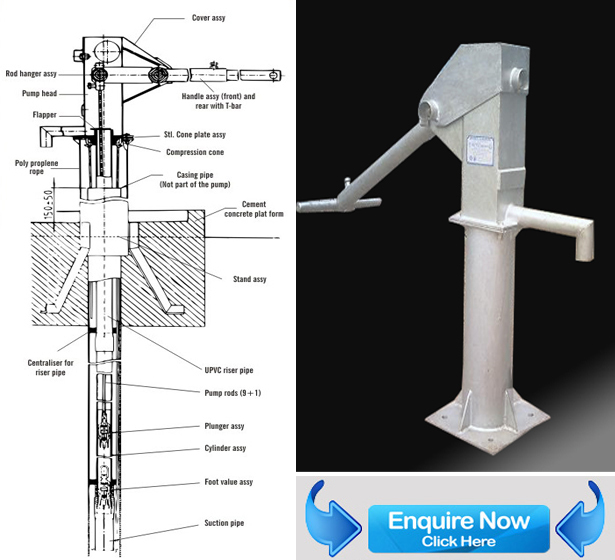 Note: If the hand pump [Afridev pump] is to be used in dug wells, suitable provision must be made for location the rising mains and modifying the suction pipe if necessary.A brief description of the major pump subassemblies and components are as given below.Pump head, handle front, handle rear, rod hanger, rod hanger pin, fulcrum pin, bearing bushes inner & outer with cover.Steel cone plate assy. with compression rubber cone.Stand assy. ( with different options)Cylinder assy. with suction pipe.Pump rods ( eye & hock type) set (9+1)UPVC rising mains (10 Nos. )Rod centralisers (10 Nos. )+ Riser pipe centralizer (10 Nos. ), polyprolene rope, fishing tool, m16 socket spanner, 2 nos of double ended spanners 17/18.Stroke Length: 225+/-3mm. Discharge – 16.5 Litres for 40 continuous strokes per minute.